In this post, I'll show you how to script a realistic splash when your whale enters and leaves the water. First, you need to add add another prim. This prim will point the Z axis down. Particles come out of the Z-axis in a prim. Add the following script to the new prim, and position it near the blow-hole of your whale. 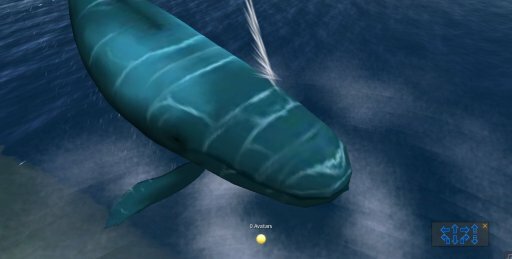 Click it first, then click the whale, and link them so you do not disturb the root prim. The box with the main scripts in it must be Yellow. This script has several functions. It has an on/off switch. It sprays a water particle in a circle. The circle spins rapidly so that you see a ring of water. The script decides how high the whale is above the water. It then adjusts the spray position so that a ring of water spray rises up from the center of the whale that is always at water level. As the whale rises, the spray gets less. float minspeed = 0.15;		// and min is about half that. float burstrate = 0.01;		// really fast.. lets swamp the viewer with particles and spray. This next subroutine will calculate the height of the water, the spew, oscillation, and size of the particles. The default function is called at start-up. Here we turn off all particles. The link_message will be executed in the child script, and the string 'msg' will become 'on'.